Qeyser Qéyum, (M) Editor in Chief, “Literary Translations” Journal Committed suicide. Jumped off eighth floor of his office building after a police summons rather than face probable detention in the camps. 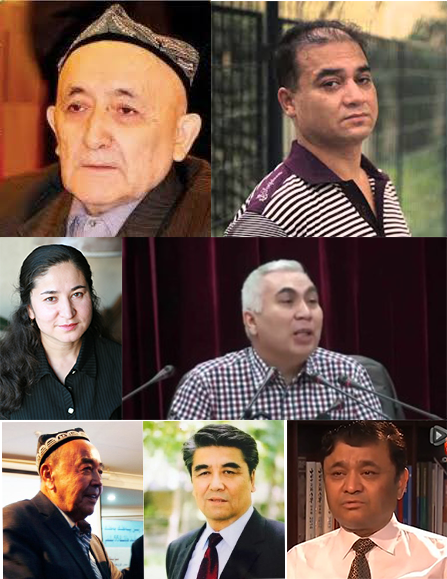 This list is composed of prominent Uyghur intellectuals whose imprisonment has been confirmed by the Uyghur diaspora outside China. The imprisonment of some individuals on the list has been investigated by Radio Free Asia; the imprisonment of the other intellectuals listed here has been confirmed by other reliable sources. While considerable care has been taking in compiling and checking the list, obstacles have nonetheless been considerable, given the information blockade imposed on Xinjiang (Eastern Turkistan) by the Chinese government. As a result, there may be errors in the list. We ask readers’ help in correcting any such issues, compiling further information on the individuals listed herein, and adding other detained intellectuals to the list. It is clear that the number of detained intellectuals greatly exceeds the number listed here. This list—and other lists of detained individuals—will be continually revised and expanded.